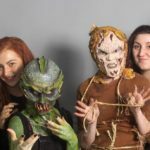 The Advanced Complete Make-up Artist Course was designed especially for students who would like to spend longer than the 16 weeks of the Complete Make-up Artist Course learning to be a make-up artist but cannot commit to a year’s study. The course is ideal for anyone who doesn’t have the qualifications for entry to the 1 year HE Certificate Course but still wants to learn theatrical, film, TV, and fashion make-up and hair to an advanced level. Acquire the professional skills and contacts to help you start your career in the industry. The Programme includes a short break after haircutting and barbering, before combined studies begin. This break may be used for catch-up classes in some cases. The course consists of one and two week modules with four weeks of Advanced Beauty and Fashion make-up and Hair towards the end of the course. All full-time students receive a kit bag full of materials for use on the course from brands such as Mac, NARS, Kryolan and Denman, as well as a copy of “The Complete Make-up Artist“, written by Penny Delamar – the Founder of Delamar Academy. This is a well known and respected text book on all aspects of make-up and will become a vital reference as you progress through the course. In addition to the modules listed below, you will be coached throughout the course in topics such as professional business skills, set etiquette, and the make-up artist’s do’s and dont’s. The most talented make-up artists must possess the right attitude and etiquette. In this module you will study facial anatomy, health and safety practises, skincare, the correct use of tools and products, the principles of light and shade, as well as colour mixing, blending, the application of bases, and beauty make-up for day and evening. You will also cover bridal make-up, corrective make-up (contouring and face shaping), and the make-up techniques required for HD TV and film. You will learn how to research and use reference photos to create period looks with make-up for film, TV, and theatre. Periods covered will include the Nineteenth Century, the 1920s, the 1930s, the 1940s, the 1950s, 1960s, 1970’s and the 1980’s. 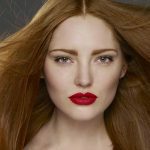 This module teaches you the techniques, product knowledge and fashion ‘eye’ for make-up on editorial shoots, catwalks and commercial jobs. You will learn the best application methods for smoky eyes, glitter, strong lips, perfected skin and graphic liner – all with the intention of being photographed. You will also learn how to follow a fashion brief and acquire knowledge of specific products and how best to use them. 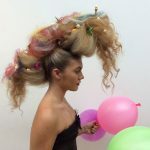 This module teaches hair techniques for use in both period and fashion hair styling. This will include using electrical equipment such as tongs, heated rollers, straighteners, and hot sticks. You will learn techniques such as styling long hair, French pleats, bridal styles, braiding, and plaiting, as well gaining knowledge of a variety of hair products and how best to use them. 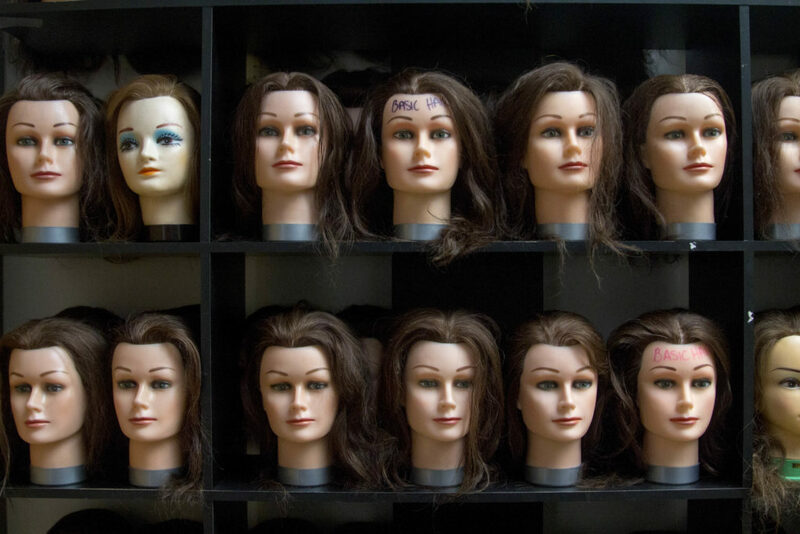 This module focuses on setting and dressing out real hair wigs with lace fronts, as used in theatre, film, and TV. 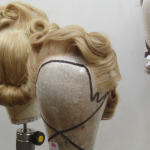 The module takes you through blocking, setting, dressing, cleaning, and washing wigs, as well as researching period styles, creating ringlets, spirals, pincurls, finger waves, and victory rolls. By the end, you will understand and be able to apply the correct styling for a particular period setting. This course starts with a visit to the National Portrait Gallery, to develop an eye for reference subjects, such as paintings – crucial to study before the existence of photographs. Building on the period techniques learned earlier in your course, you will research a period look of your own choice to combine period make-up and hair for creation of an individual project. This will involve setting, dressing out, fitting, and applying wigs, as well as using costume to achieve the final finish for your required look. This module is focused on researching facial hair through the ages. You will learn how to knot a piece of facial hair, how to dress and tong moustaches, beards, and sideburns, as well as all the skills needed for the application, maintenance, styling, and cleaning of facial hair. Applying make-up with an airbrush creates a flawless base. During this week you will learn to research, develop designs and apply airbrush make-up, with one day spent entirely on body painting. You will use sponges, brushes and airbrush techniques – including the necessary health and safety issues associated with an airbrush machine. There will be free-hand painting, shading and blending, cutting stencils, and you’ll complete the module with an individual body-painting project. This is one of the most popular modules of the course – and for good reason! You will learn how to research various casualty effects, using reference material, to create bruises, scars, open wounds, stitched wounds, grazes, cuts, burns of all types (first to third degree), and different blood effects. In addition, you will create dirt, sweat, and tears effects, learn how to maintain an effect for continuity over time, and how to create illness, spots, diseases, and track marks. 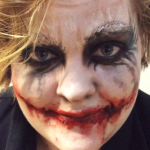 When a character needs to age, sustain injury or even change gender in Film, TV or Theatre, the make-up artist needs the knowledge and techniques we teach in this module. This is a one day module where you will learn how to apply camouflage make-up for concealing tattoos, blemishes, and scars. 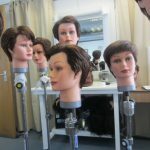 You will learn how to apply a Bald Cap, as well as designing, making, and applying a range of prosthetic pieces. 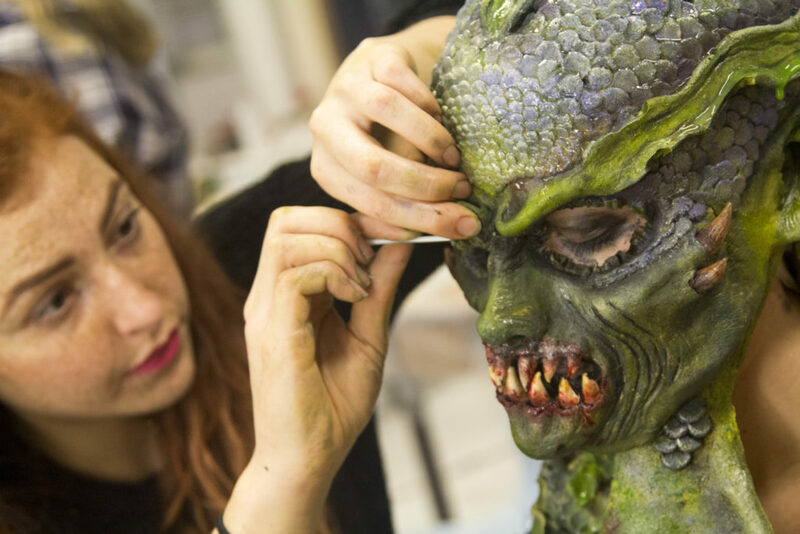 The 2-week module also covers the theory of prosthetics and working procedures, health and safety practises, mould making, sculpting, silicone runs, preparing moulds, and the application of prosthetic pieces with make-up to achieve a finished look. 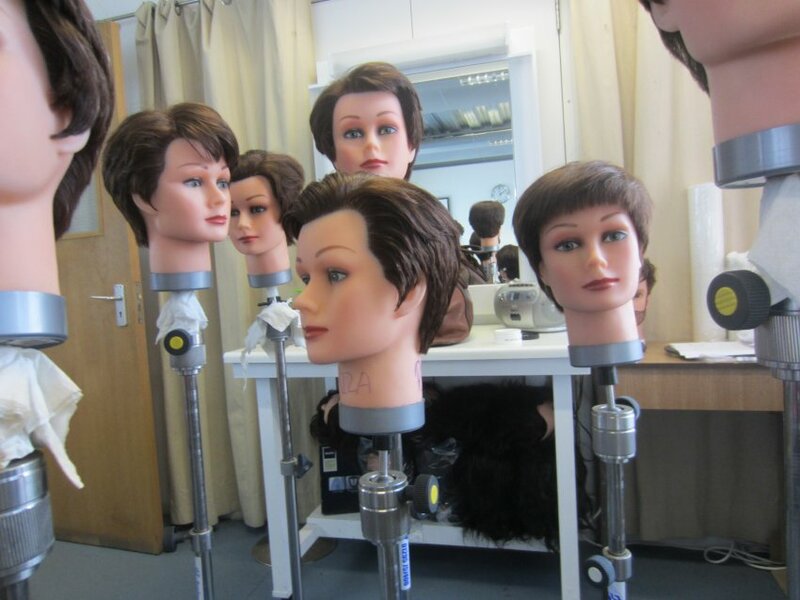 In this two week course you will develop the skills learned in Basic Hair. 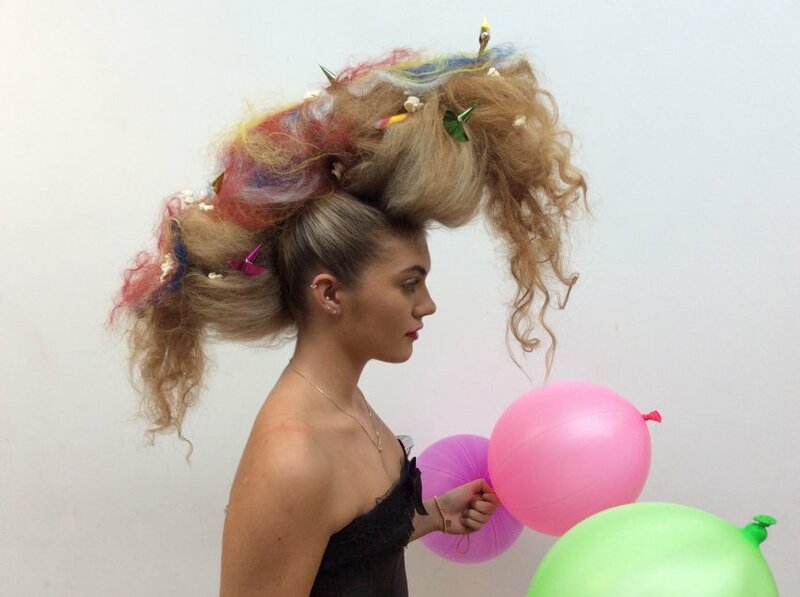 You will learn more technically challenging styles such as red carpet hair, bohemian fashion looks, braids, candy floss styles, coloured extensions, hairpieces plus many more advanced techniques. 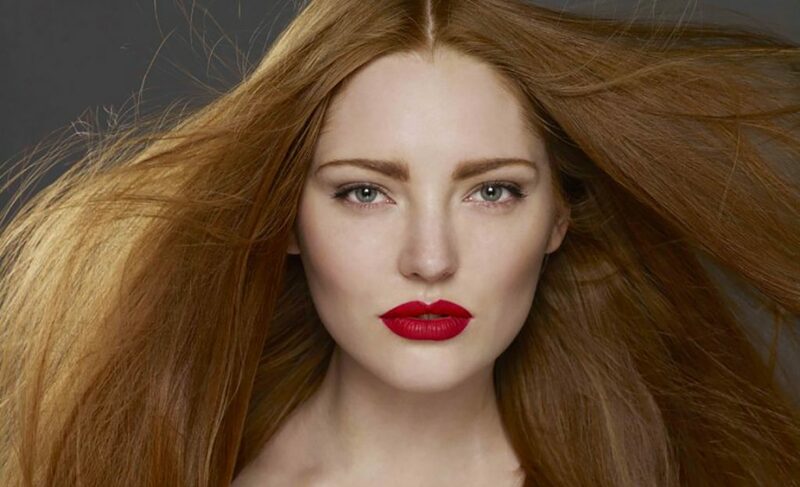 For students who wish to pursue hair work, these classes are invaluable. During this week you will learn the basic principles and techniques of hair cutting on men. You will start on dolly heads and move onto working on real people! This course covers scissor over comb techniques, clippering, cross checking, soldier cut, texturizing, fading and styling. Men’s barbering and clipper cuts, beard trimming and much more. These skills are invaluable for any make-up artist pursuing a career in TV and film, as you will often be presented with a male actor to groom, and basic barbering skills are essential. An intensive four week course where you will study different period looks adapted as a fashion reference, with special attention paid to work by the industry’s top artists such as Pat McGrath, Val Garland, Lisa Eldridge, Wendy Roe, Isamaya French, Mary Greenwell, Alex Box and Charlotte Tilbury. You will learn the advanced techniques for creating editorial and commercial looks with glitter, crystals, kohl and different mixing mediums (to name but a few areas covered). We work from mood boards comprised of leading, current and iconic fashion books and magazines. This course really prepares our graduates to work in the industry on jobs including but not limited to: behind the scenes at Fashion Week, on set for a commercial, editorial or beauty photo shoot, ad campaigns, music videos, red carpet events and private client work. At the end of this course, students have a photo shoot with professional models and photographers to build their portfolios, and some of the photos are in our course gallery are to the right. Building on the skills taught in casualty and character weeks, these 2 weeks fully explore in further detail the building up of a character. Casualty skills are developed, using a wide variety of products, and master classes from top industry experts ensure a thorough understanding of blood work, wounds, bruises, zombies etc. to a high standard. Project work and practice in following the brief will help in combining all the techniques to produce the make-up result required. In addition, there will be industry masterclasses on understanding and following continuity, script and character breakdowns, understanding set etiquette, guidance on writing a CV and cover letter, speed tests and a lighting day with a professional cameraman with an HD camera and monitor. The well-equipped, airy classrooms of Delamar Academy are located within the world-famous Ealing Studios, West London. In our spacious classrooms, you’ll have your own personal workstation – including professional lighting, make-up chairs and equipment. Ealing Studios is home to a number of other companies that form a real media community, with visual effects, production, editing, outside broadcast, and record companies all represented. There is also a Film School, which offers a first step in studio experience for our own students when they work on graduate films. The please call our Enrolment Manager, Monika on 0208 579 9511 or email monika@delamaracademy.co.uk to discuss your course needs, the qualifications for entry, and to arrange an informal interview. Following a successful interview a 25% deposit and a completed enrolment form will guarantee your place on the course. The remainder of the fee is due a month before the course starts. Where spaces are still available within a month of the course start date (there is no closing date for course entries where spaces are available) the full fees are due on enrolment. If the course is full we would recommend being placed on the waiting list. We will contact people on the waiting list if a student asks to defer. The Academy will be closed during bank holidays, if your course is affected, some days may be added onto the end date. 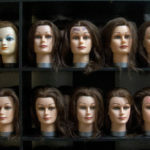 We understand that some people come to us having been trained in hair or other skills. For these people who wish to omit a module, we will reduce the price of the course accordingly.